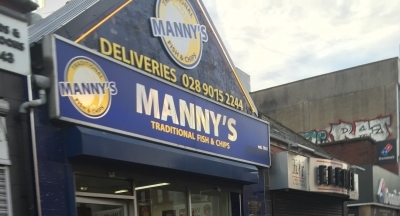 Ask anyone from North Belfast about Mannys on the Antrim Road and you will most likely here good things about it. Have you got Google Earth on your computer? If so, then download the Google Earth Map of Mannys Carryout. Is this the wrong position for Mannys Carryout? If you think so, then modify its position. The best fish and chips in Belfast. My favorite stop for food when in town. You can tell how good a place is by the number of teens in front of the shop ... and there's always a group in front of Manny's.